Hillsborough County Commissioners recently approved a $2.6 million expansion project of the Bloomingdale Regional Library, which will provide an additional 10,000 sq. feet of people space bringing the library’s total size to 25,000 sq. feet. 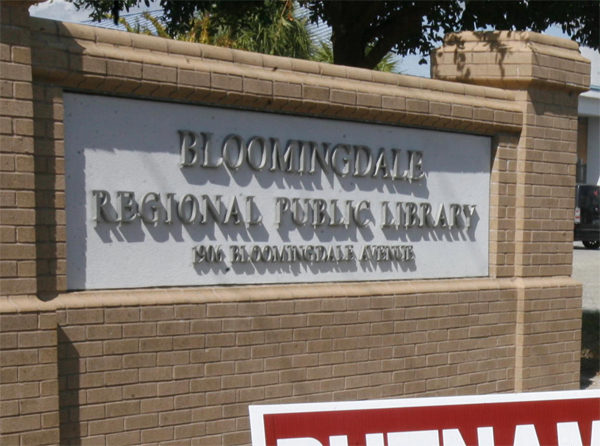 Thanks to some funds that became available in the library’s budget last August, Hillsborough County Commissioners approved a $2.6 million expansion project to be done on behalf of the Bloomingdale Regional Library. Hardly a surprise, as the 15,000 sq. feet facility, which opened its doors to the public just five years ago as a regional library serving communities in east Hillsborough County, including Bloomingdale, Valrico, Lithia and FishHawk Ranch, is also one of the smallest and the busiest in the county. From the start, the community embraced the new addition, which today boasts of handling more than 55,000 items per month, not to mention the results of the 2009 fiscal year that recorded 411 programs with 9,300 in attendance. “This number will likely be exceeded this year,” said long-time librarian Eloise Hurst. The allocated funds will allow the library to receive the much-needed phase lift and a 10,000 sq. feet expansion, which will increase the facility’s size to 25,000 sq. feet. According to a newsletter recently published by the Friends of the Bloomingdale Library, the project’s time table calls for a completion and reopening date of October 2013, following the necessary design, permit and construction bids phase, which according to David Wullschleger, will push the project’s start date to late 2011. The Bloomingdale Library currently houses a collection of more than 100,000 items for all ages – a broad range of popular fiction, nonfiction, DVDs, music CDs, books on CD, periodicals and Spanish language materials. A separate genealogy room contains books and online resources to aid family history research. The Children’s Room provides a kid-friendly space for pre-school and elementary age customers and their parents or caregivers. In addition to the collection of children’s books and DVDs, the room offers computers configured just for kids and child-sized tables and chairs. Online and Internet access is provided through library computers, a computer lab and WiFi connectivity. The library routinely offers a variety of programs and computer training classes for children, teens and adults. To make check out of library materials fast and easy, the library is equipped with state-of-the art RFID technology – including express check out stations for customer use. Public meeting rooms at the Bloomingdale Regional Library include the McLean Community Room (named to honor members of the family that formerly owned the land where the library is sited) and three other rooms can be used for quiet study or small group meetings. As always, the Friends of the Bloomingdale Library welcome all the support and help from members of the com munity. For more information, please visit www.hcpl.org or call 273-3652.